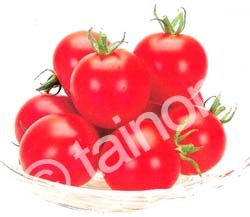 Tomato 番茄 | Tainong Seeds Inc.
Slightly bigger size than standard cherry tomato, deep red color with very good taste. 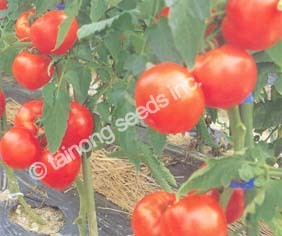 Fruits weigh 25~30 g. Resistant to Fusarium (race 1,2) , Nematode, TMV (Tm 2a) and Verticillium. 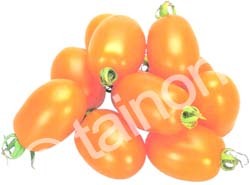 Grape/plum shape tomato type with orange color. 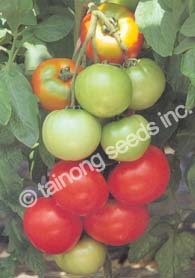 Fruits are ~4.5 cm long, weigh ~25 g.
Resistant to TMV (Tm2a) and Fusarium (race 1, 2). Early, vigorous, indeterminate type, large leaves, short internode. Fruits are 240 grams, red, deep oblate, smooth with green shoulder, 6 to 7 loculi, 5 to 6 fruits per cluster. Highly tolerant to Verticillium, Fusarium 1, 2, Stemphylium and Nematodes. Very strong tolerance to heat. 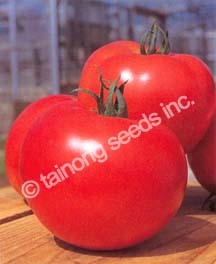 Known as “Momotaro” in Japan, this variety is very popular. Extra early, vigorous, indeterminate type, medium sized leaves. Pink fruits are deep oblate with green shoulder, 220 grams, 6 to 7 loculi, 6 to 7 fruits per cluster. Tough skin, very sweet, tolerant to cracking. Highly tolerant to Fusarium 1, Nematodes, Stemphylium and Verticillium. Early, vigorous growing, indeterminate type, large leaves. Fruits are 220 grams, red, oblate with green shoulders, 6 to 7 loculi, 5 to 6 fruits per cluster. Tough skin, firm meat, crack free, long shelf life. Good for long distance shipping. Highly tolerant to Bacterial wilt, Fusarium 1, Nematodes and Stemphylium.